Ravensburger Disney Puzzle (40320 Pieces) - Best Price! Home Amazon Ravensburger Disney Puzzle (40320 Pieces) – Best Price! Ravensburger Disney Puzzle (40320 Pieces) – Best Price! How long would it take your family to finish this 40,320 piece puzzle?! You would definitely want to display it after finishing it!! Hurry and get the Ravensburger Disney Puzzle (40320 Pieces) today for only $275.95 from Amazon, which is the best price ever!! This puzzle is over 6 feet tall and over 22 feet long!!! It’s HUGE!! 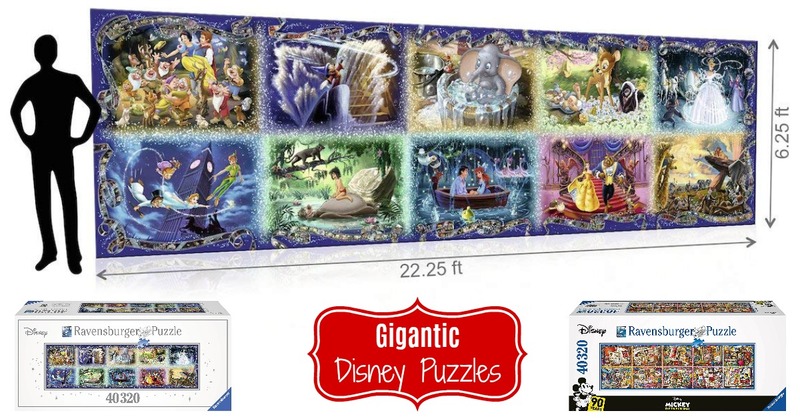 Or, choose the Disney Mickey 90th Anniversary edition Puzzle (40320 Pieces) which is also currently the best price ever on Amazon! Be quick since this is a limited time Deal of the Day – it’s available today only while supplies last. Check out all of the recent Amazon deals here! This puzzle isn’t just big, it’s huge. At 40,320 pieces it is Ravens burger newest and largest jigsaw puzzle measuring 22.3 feet long by 6.2 feet tall at that size and piece Count it the largest commercially produced puzzle in the world. Since 1891 we’ve been making the finest puzzles in Ravens burg, Germany. It’s our attention to detail which makes Ravens burger the world’s greatest puzzle brand. We use an exclusively developed, extra-thick cardboard and combine this with our fine, linen-structured paper to create a glare-free puzzle image for a quality you can feel. Our steel cutting tools are designed and crafted by hand. This ensures that no two pieces are alike and guarantees a perfect interlocking fit. Buy the Ravensburger Disney Puzzle (40320 Pieces) from Amazon.